My grandmother Lois was not known for her cooking. Well, maybe I should say she was not known for her good cooking. She was famous for her judicious use of the pressure cooker, for serving economic cuts of meat like tongue and tripe, for insisting on cooking on her own mother's 1905 wood burning stove (even in 2005), and for her love of canned...everything. Lois's dishes always contained at least a pinch of cat hair. One thing she was good at was mixing a drink. I can remember shuffling downstairs in my pajamas at 11:00 in the morning on my summer holidays, to find Grandma at the breakfast table with a tumbler of 'juice,' which she must have felt she deserved after a morning of tending her garden, cutting the acre and a half of back lawn, playing bridge (and winning, no doubt) with the ladies at the Senior Center, completing the New York Times crossword of the day, and drawing up a 'to do' list for everyone else in the house, all before her grandchildren could even be bothered to get out of bed. It must have felt positively like afternoon by the time she reached 11:00. As my uncle says, Grandma was a woman of traditions and routines. She always drank coffee from the same mug. She always served porcupine meatballs for Christmas Eve dinner, with a dessert of green jello and maraschino cherries. She always ate dinner at 6 o'clock. And at 5, it was always happy hour. As a young wife and mother, Grandma started happy hour the minute my grandfather came home from work. Everything else stopped: no cooking, no cleaning, no kids running around the house. The two of them would each have a cocktail, a salty snack, and a cigarette (it was the 50's after all), and sit together to talk about their day. A simple moment, but one to look forward to. No need for instructions on this one, just put it all in a glass and stir. What a lovely story & so sorry to hear about the loss of your grandmother too. 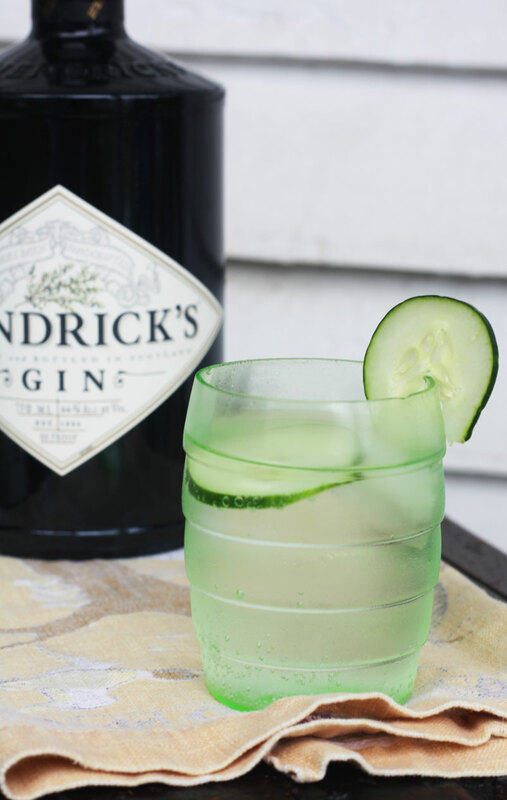 Hendricks gin, now you're talking. 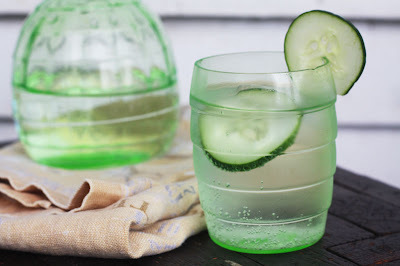 It's against the law to serve it with lemon, cucumber or jail as far as I'm concerned LOL. I love the stuff as you can tell hee hee. Thanks Debs! I'm totally converted to the stuff, best G&T I've ever had!! A pinch of cat hair? Was she a witch (smile & kidding)? Lois' drink looks wonderful. I could use one right now with all of this unpacking I'm doing! Thanks Sasa, I'm glad to be back. As you can see, I've had a few things on my plate the last few months, but happy that things are settling down a little! Stella, I don't think she was a practicing witch but I'm pretty sure she got called one every now and again- she was a tough lady! G&T goes well with moving, I recommend it. I loved your post.... I can see your Grandmother smiling down on you and your afternoon drink...I love stories about grandparents.... please read one of my favorites from a southern writer... what a difference there is in what grandparents pass out to their grandchildren. fabulously written story. thanks for sharing it. Russian Princess- thanks for the comment and the lovely link. I love reading about people's memories of their grandparents, too! Stephanie- Yes, I guess the little people might object to happy hour. I think for my grandparents it worked because my mother, uncle, and aunt knew they'd catch a heaping helping of stern 50's discipline if they disturbed the adults...that might not work so well these days!